Want to build an electric car, but don't have 10K to spend on the project? Forklift salvage is the way to go! You'll find other DC motors on a forklift, but to move your car, you'll want the series wound one - usually this means the traction motor. You might even find a suitable AC motor on a newer forklift. ...weighing 100 to 150 pounds. Lighter than this, and it will strain to move your vehicle and booty. Heavier than this, and you're using pounds for motor that could have gone towards batteries. Insulation that is wine colored with yellow banding,Brush leads that are still copper colored and not scorched,A commutator that isn't grooved or pitted,Armatures that have a commutator with a large bar count. Why? Because the larger the bar count, the higher the voltage it'll take. ...with solid field leads, or you might end up with a motor that doesn't suit your needs. Solid field leads, flat wires, mean "series wound motor". Make sure the shaft is something you think you can attach to or modify. 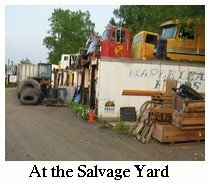 You can salvage a whole bunch of stuff from a forklift, which can then be SOLD on Ebay or wherever to finance the rest of your conversion. Darin Cosgrove, one of the partners in the Forkenswift project (mission: to build an electric car conversion on a beer budget), discovered this resale trick brought the Forkenswift's conversion budget from $2200 CDN to something more like $600. Read my interview with Darin on his forklift salvage project here. 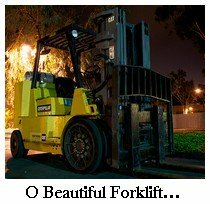 There's usually more than one electric motor on a forklift to salvage. There's a right way to drain the hydraulic lines. Scrap metal plate salvaged from the forklift can be used to build a transmission adapter. Me: Why do some motors have two power lugs and some have four? Jim: Two posted motors only run one direction and are pump motors, unless they are a per mag which switching the cables would make it reverse. 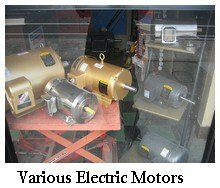 4 studded motors are usually drive motors (they do have 4 term'd pump motors, but rare and are just motors that could have been used for either a CW or CCW rotaion pump. Series wound motors have thick, corse, field windings. If you see thin wire, it's a sep-ex or compound wound motor. 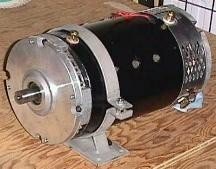 Can you feed a motor any amount of voltage without damaging it? Jim: No. Motors are limited (in huge ways) by the number of commutator bars they have; the higher the bar count the higher the voltage it can handle without arcing. Higher voltage rated motors also have field coils with smaller wire but more turns, and are the only differences between some of ADC's 36 vs 72 volt rated motors. It's not like a 24 V motor will melt if you feed it 36 V it might over-rev it to death if it's not under load. Voltage creates speed, current is torque. 100 amps at 48 V is the same work as 48 amps at 100 V of equal 4800 W. General rule is "volts up, current down". The "flashovers" that the racers see constantly is caused by excessive voltage so little extra won't kill it but a lot will. Will any 8 inch 36 to 48 V motor work okay with 144 V? How does the horsepower change with added voltage? Jim: a lift motor can usually be over-volted (by the data tag rating) 2 to 3 times with 120V being used a lot already. You do have to advance the timing 7 to 10° depending on many many factors. 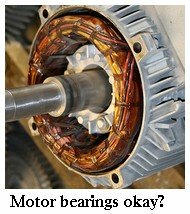 How can I tell if the motor is a series wound or shunt wound just by looking at it? Jim:Series wound versus shunt wound or sep-ex use a small wire with lots of turns on the field coils series wound have thick flat wire with just a few turns 8 to 14. You can visit the DIY Electric Car forums or Jimerico (Jim's company) for more information!